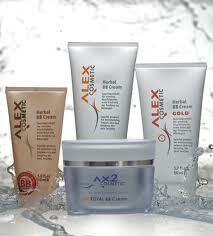 BB cream, and if you want the best get Alex Cosmetics BB Cream. I have been using their Royal and Herbal BB Creams. It is made for all skin types. Not only does it give amazing coverage, but it soothes red, irritated, blemished and problematic skin. So you’re not just covering up flaws, you’re actively getting rid of them. These BB creams have many natural, beneficial, ingredients other products do not. I recommend looking through the website to find the one that is right for you. So get some Alex Cosmetics, and give some too…..